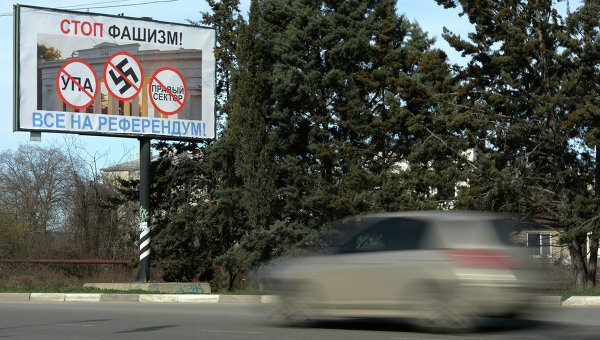 SIMFEROPOL, March 11 (RIA Novosti) – The Crimean parliament on Tuesday banned the activities of nationalist political organizations instrumental in the recent Ukrainian revolution, citing security threats. The blacklist includes the far-right Svoboda party and the neo-Nazi Right Sector movement, which oppose the campaign for Crimea – a majority ethnic Russian region within Ukraine – to secede and become part of Russia. “The Crimean authorities are making all possible efforts to prevent the infiltration of extremists onto the territory of the republic,” Crimea’s Supreme Council said in an explanatory statement to the resolution. The statement cites the fact that Right Sector leader Dmitry Yarosh has been charged in absentia in Russia of extremism, while another Right Sector activist, Alexander Muzychko, is wanted in Russia on suspicion of torturing and murdering Russian servicemen in Chechnya in the early 2000s. Both men have been put on an international wanted list. The Supreme Council ordered the republic’s security forces to detain and prosecute anyone suspected of inciting ethnic hatred and calling for violence. Crimean officials announced last week that they intended for the peninsula to become part of Russia. A referendum on the issue has been set for March 16. Authorities in Kiev and international leaders have condemned the referendum as illegitimate and accused the Kremlin of attempting to annex the region. That’s the way Vlad, set the parameters early, then they will have no excuse when they limp off bleeding. Is it right for people to be tarred with the epithet NAZI, if they genuinely are nothing more than patriots? Agreed this lot are just paid thug rioters, but I note many around the world are conveniently labelled NAZI by the PC and press for just wanting things as they were when we were all less manipulated and much happier with national pride and patriotism?